I do alot of sanding I find it fun. But my sandpaper was unorginized. I got the craftsman sandpaper kit and found it very useful. Not only it comes with a cool case for the sandpaper, it even comes with lots of sandpaper! I use this kit every day and very happy with the kit. Highly recomend buying it. It retails for $19.99 but I got it on sale for $9.99. I would give it a 5 star rating! how does that case work. I use a hanging folder things for my paper, is it something like that? 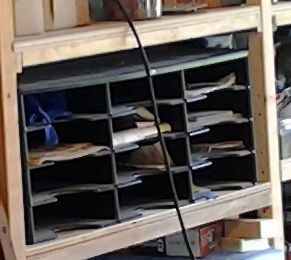 Also, do you remember what grits and how much i came with, always looking for some deals on sandpaper, but I use it mostly for my job vs woodworking. It looks like it’s just one of those expanding file folders with the cman name on it. Amazon sells them too; I might grab one or two. Does any one know a good place to get sand paper lower cost side? Thanks for the review, I might pick one of those up. Good to see your McMaster-Carr catalog there! 108 is an older one, but hang on to it! Those are getting harder to acquire..
How about a link to this kit. I cannot find anything more about it.